Recipients of Delmar T. Oviatt Library Scholarships gather at CSUN's Orange Grove Bistro to celebrate and meet the donors who made the scholarships possible. 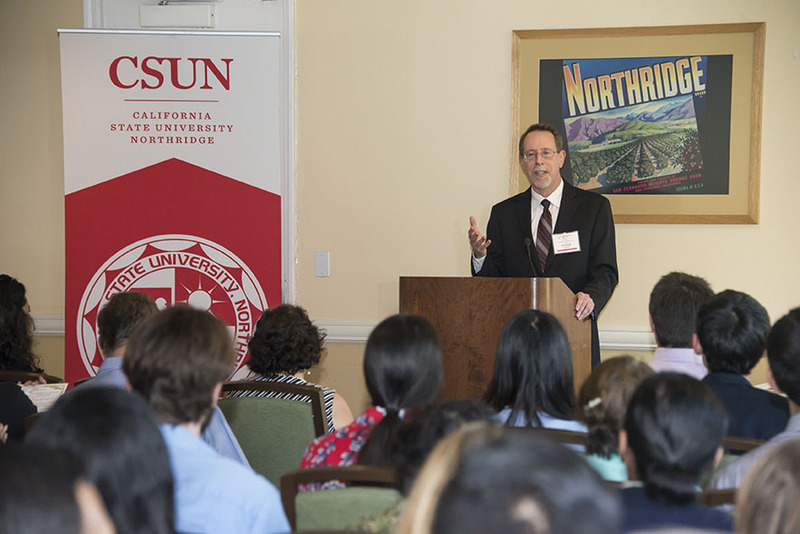 Mark Stover, dean of the Oviatt Library, presents certificates to scholarship recipients and recognize donors during the ceremony on March 30. 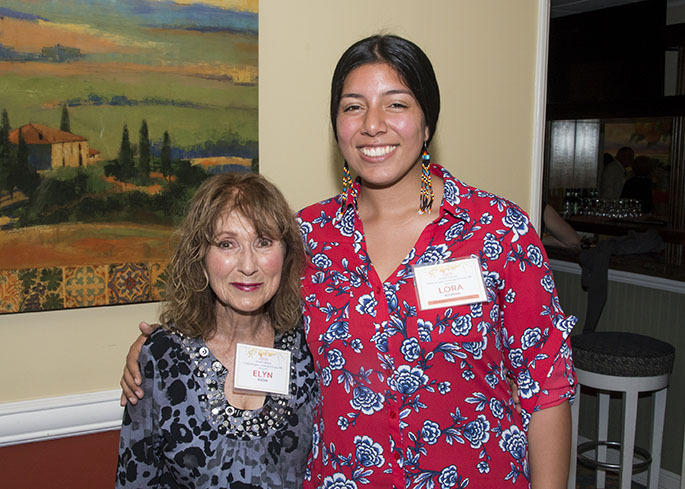 Lora Rosman and her grandmother Elyn Rudin celebrates Rosman’s honor as one of three Ann & David Perkins Scholarship winners. 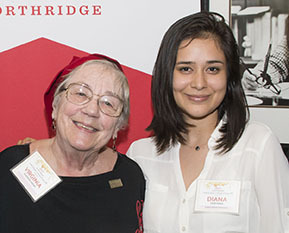 Diana Takehara (right) will finish her communications degree with the help of the scholarship that Virginia Elwood-Akers (left) provided. Lora Rosman’s passion and ambition motivated her to pursue a major in psychology with a minor in American Indian Studies, to become a marriage and family counselor who travels to assist indigenous communities across the country. Art major Eduardo Chavez fell in love with art in high school and hopes to become an animator, to create images where everyone can be reminded that they matter. Initially unsure of her career path, sociology major Mayra Rodriguez discovered a love of advocacy for others, after working in the mental health field as a certified legal Spanish/English interpreter. Although they have different dreams and goals, these California State University, Northridge students do have some common ground: They work at the Delmar T. Oviatt Library, and they are recipients of 2017 library-funded scholarships. 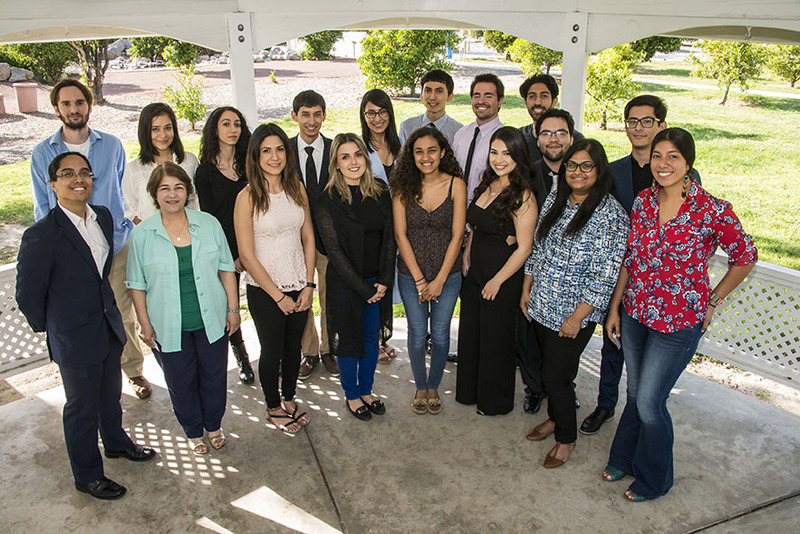 Rosman, Chavez, Rodriguez and 19 other students were honored at the Oviatt Library’s Student Employee Scholarship Reception, held March 30 at the Orange Grove Bistro on campus. This was just the second annual reception, but the library has offered at least 20 $1,000 scholarships each year for the past five years. Before the presentation, scholarship donors and recipients got to know a little more about one another. During the program, Mark Stover, dean of the Oviatt Library, presented students with scholarship certificates, and they thanked the donors. Virginia Elwood-Akers, the donor behind Takehara’s scholarship, couldn’t agree more. Andrew Gomez-Ramirez, a guitar performance major who works in the library’s Special Collections and Archives, said he plans to use his Ronald and Elizabeth-ann Purcell International Guitar Research Archives (IGRA) Scholarship to help with his living expenses and to save for a professional guitar. He said he hopes to parlay his passion for music into a teaching career, to pass the gift of music on to future generations. “To me, [the scholarship] represents an investment to further my career in music,” Gomez-Ramirez said. Samuel Thim, a business law major who works in the library’s Finance and Personnel Department and a recipient of the Ann & David Perkins Scholarship, thanked the assembled scholarship donors on behalf of all the recipients.